Grizzly Bear Suspected In Fatal Yellowstone Attack Captured : The Two-Way A female grizzly bear suspected in attacks, one of them fatal, at campsites near Yellowstone, was captured along with 2 of 3 cubs. Besides the dead camper, two were injured. The bear will be killed. A female grizzly bear thought to be responsible for horrifying night-time attacks that killed one camper and wounded others as they slept near Yellowstone National Park in Montana was captured, wildlife and law enforcement officials said. The bear was caught in a culvert trap (here's an example of one) after it returned to the scene of the attack just as officials had suspected it would. The bear was caught with two of its three cubs. No word in any of the reporting I've seen on the on the whereabouts of the third cub. The bear will be killed, if it already hasn't been. There was no indication from authorities on what would happen to the cubs aside from the information that they wouldn't be returned to the wild. People knowledgeable about bear behavior say the Tuesday attack on sleeping campers was unusual in that it wasn't a case of a mother bear or sow displaying protective behavior. Instead, the bear entered several tents and attacked the campers for no reason readily apparent to humans. The man who was killed was camping alone at a site a quarter mile away from where other campers were attacked. Campers Paige and Don Wilhelm, of Aledo, Texas, were camped in site No. 12 of the 10-acre campground when they heard a scream at about 1:30 a.m. At first, they thought it was just teenagers screwing around. They checked on their two boys, ages 12 and 9, and then tried to go back to sleep. Then they heard another scream, this one closer. “I heard somebody yell, ‘Stop! No!’ ” said Paige Wilhelm. As they arose to dress, they heard a bear come by their tent, making a “huffing” sound. 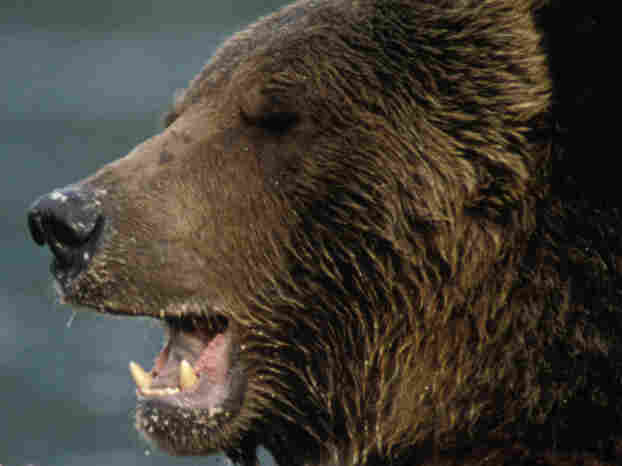 The Missoulian reports that the woman, Canadian Deb Freele of London, Ontario, eventually played dead, which caused the bear to break off the attack. While attacks like this are unusual, it did cross my mind that one result of something like this could be that more national park campers decide to protect themselves by packing guns along with their sleeping bags. And who could blame them, now that it's legal to do so?